"How can the immigrant of yesterday be lionized as the very foundation of the nation's character, while the immigrant of today is often demonized as a threat to the nation's safety and stability?" asks volume editor Vanessa B. Beasley in her introduction to this timely book. Through their rhetoric, presidents help to create the frame for the American public's understanding of immigration. In an overarching essay and ten case studies, Who Belongs in America? 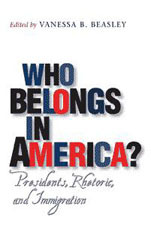 explores select moments in U.S. immigration history, focusing on the presidential discourse that preceded, addressed, or otherwise corresponded to events. These chapters share a common interest in how, when, and under what circumstances U.S. presidents or their administrations have negotiated the tension that lies at the heart of the immigration issue. The various authors look at the dual views of immigrants as either symbols of hope and opportunity or as scapegoats for cultural fears, especially during trying times, and consider how U.S. presidents have navigated between these two motifs. Since 9/11, few issues have more public significance than how America views immigrants. The contributors to this volume provide context that will help inform the public debate, as well as the scholarship, for years to come. VANESSA B. BEASLEY, an associate professor of communication at the University of Georgia, is the author of You, the People: American National Identity in Presidential Rhetoric, also published by Texas A&M University Press. Her Ph.D. is from the University of Texas at Austin.